4th Street. In 1901 he moved to 1003 Pine Street. In 1903 he joined the British Numismatic Society. Later on he specialized in coins, firearms and Indian relics. In 1904, he moved his shop to 115 North 11th Street, and hired Burdette Johnson to work in his store. Collection - The Chapman Family Archive. in the February issue of The Philatelic West. Lupia Numismatic Library, Special Collection, The Philatelic West. In 1902, he married Anna “Lena” Magdelina Seim (1878-), a first generation American of German parents, and they had a daughter named Ruth (1903-). In 1911 he moved to 30 Elm Place, Webster Groves, Missouri, where he worked in his business as an antique dealer. permission of H. L. Lindquist, publisher. Apparently published posthumously. of John O’Connell estimated his death about February 1st. cover. Courtesy Lupia Numismatic Library, Special Collection, The Philatelic West. cover. Note he is now soliciting for coins and stamps. Courtesy Lupia Numismatic Library, Special Collection, The Philatelic West. Collection - St. Louis Stamp & Coin File. 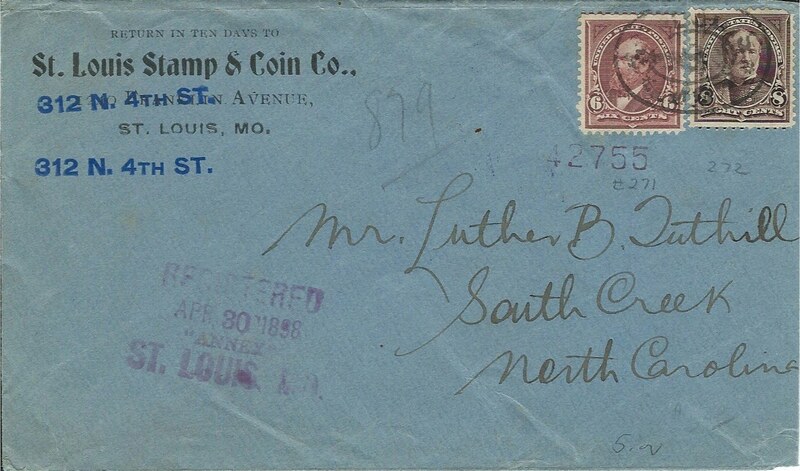 Note the addressee is a very famous Confederate Paper Money Dealer, Luther Brown Tuthill (q.v). The postage stamps are U. S. Bureau Issues printed 1894-1898, Scott Nos. 271, and 272. Fig. 6. 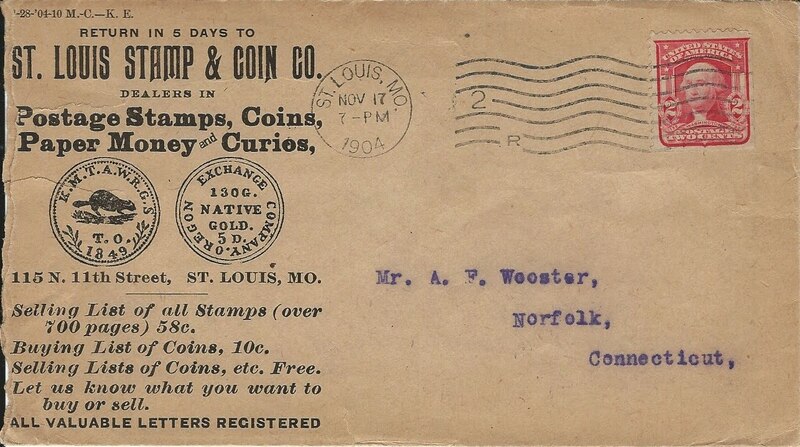 St. Louis Stamp and Coin Co., advertisement in Philatelic West and Camera News, Vol. 8, No. 2, December 1898 3d leaf from back. Courtesy Lupia Numismatic Library, Special Collection, The Philatelic West. Fig. 7. 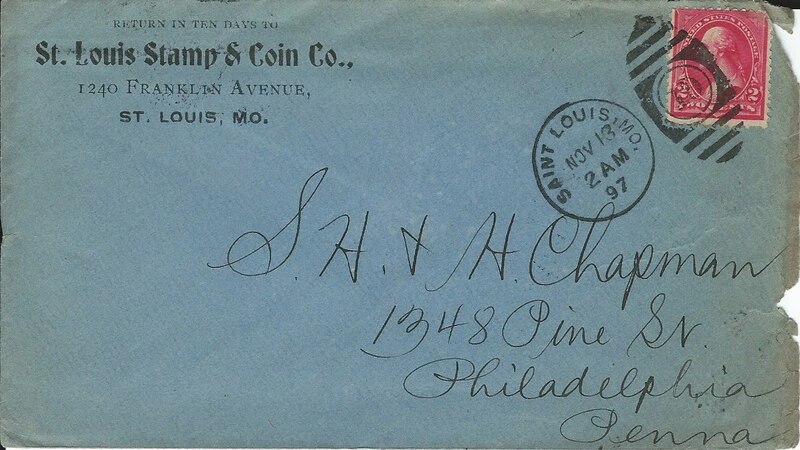 Courtesy of the Lupia Numismatic Library Special Collection - St. Louis Stamp & Coin File. Ellis to the Canadian chemist and numismatist, Richard Wellington Williams at Three Rivers, Quebec, Canada, postmarked December 21, 1903. Fig. 8. World's Fair St. Louis, postmarked December 31, 1903. Lupia Numismatic Library Special Collection - St. Louis Stamp & Coin File. .
Numismatic Library Special Collection - St. Louis Stamp & Coin File. 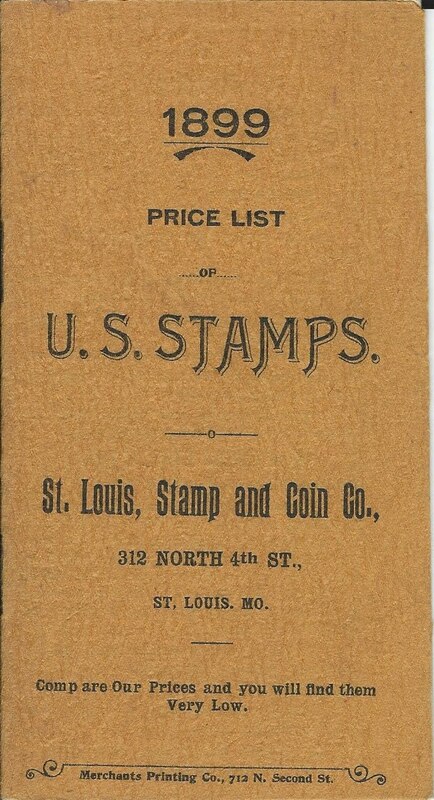 St. Louis Stamp & Coin File. Note the postage stamp Scott No. 301 is the lower right corner specimen from a booklet pane of six stamps. West increased under Burdette G. Johnson after 1904. 2316 lots, 4 halftone plates of coins.